No, I wasn't planning on sleeping tonight anyway. Or the rest of this month, for that matter. Earlier this month in Sichuan, China, the Insect Museum of West China went on an expedition and found the largest dobsonfly of its kind, Xinhua reports. Look at those mandibles. They are pure nightmare fuel. 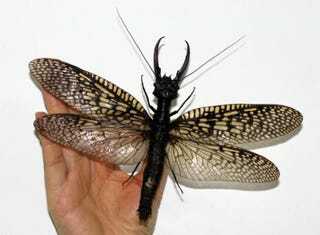 If you are wondering how big this particular insect is, its wingspan measures 21 centimeters (over 8 inches). Previously, the largest specimen was found in Brazil and had a wingspan of 19.1 centimeters or 7.48 inches. This bug, it seems, can be found in many different countries. That's comforting. Apparently, your standard male and female dobsonflies can have wingspans of 5 inches. Well, that's horrifying. If these numbers still don't compute, ChinaNews has a photo of this water bug compared with an egg.